On Sundays, when we’re in the country and the weather obliges, the four of us like to get up into the hills and get our legs moving. Even the little legs, by now, are pretty capable at trudging up the steadier inclines, the little hands know how to claw up rock faces and grip the strong roots of trees. We started off using the cobalt blue baby backpack that now carries my nephew, but both girls have run on their own steam for the past couple of years. Often there are complaints, resistance. Sometimes there are tears, but if we didn’t force ourselves out, messily, we would pass a day lolling in the easy softness of our yard. I suppose these hikes are for us what church is for other families: a quiet place to admire all that is bigger than we are, to appreciate our little community, to reflect on what’s good and what needs fixing. It’s cleansing to be able to lose ourselves in that leafy, loamy world, especially when the one outside is plagued with tornadoes, tsunamis, terrorists, and people who set playgrounds on fire. 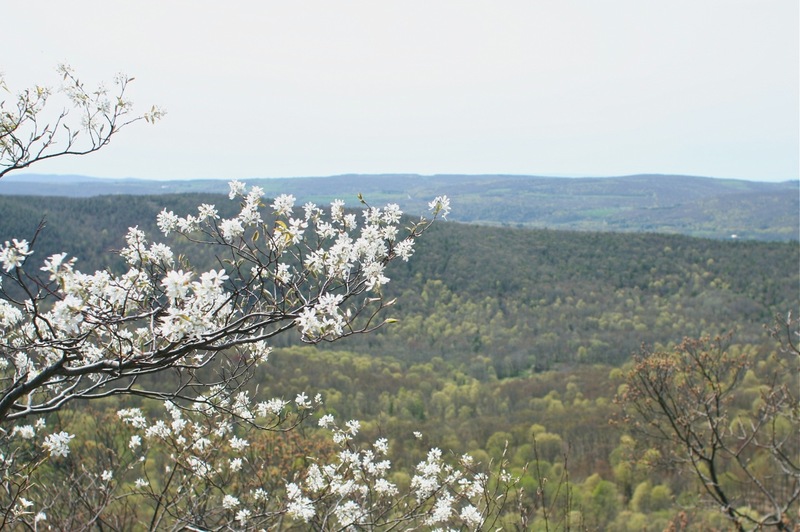 Our favorite destination these days is Macedonia Brook state park, at the Western end of Connecticut. Its expanse stretches out endlessly green in the warm months, blazes bright and unreal out of the valley in autumn, and turns raw and contrasty against the muted winter sky. This time of year, we trek up under the thinly clad trees, and through them glimpse the valley rolling away, the new leaves sparkling like peridots among the branches. The hike we usually choose, Cobble Mountain, winds up through the forest, skips across streams, scrambles over a field of lichen-covered boulders, then reveals its secret view, over gentle foothills and glimpsing the bluish Catskills in the distance. Most times, we pack lunch for the top. There’s some grumbling, yes, and the requisite whip-cracking. But I think the four of us agree we always feel calm and nicely tired afterward, buzzing a bit from all that free oxygen. The last time we went, on May Day, Spring was still tender upon the park, and we hit the trailhead only to bump squarely into a towering man in overalls and bushy, bleached-out eyebrows, holding a straw hat full of freshly-dug ramps in one hand and a leash in the other. The leash was attached to a black and white goat, and a matching goat was being toted by the man’s embarrassed-looking teenage daughter. We stopped and chatted with them for a while, because this is not a sight you see every day, and my daughters insisted on meeting the goats. The goat stared out of slitted pupils, unblinking, and flicked a fly off his ear. I’m sorry I didn’t get a photo of them. I was so awestruck that I forgot about the camera hanging, tourist-style, around my neck. Actually that’s not quite true, because I did become aware of the camera’s weight just before we parted ways, but I couldn’t bear to mortify the teenager any more than she already had been. My daughters will be there soon enough. Find a good, steady pace that will work for the long haul. Learn to trust your own footing. When crossing a stream, always test the rocks. Choose strong, solid ones. Avoid the wobbly unreliable ones. No one’s going to carry you. If you fall, pick yourself up and get on with it. You may not always know where you’re going. Keep an eye out for markers. The reward is not always at the top. It's all around you, if you look closely. You are part of nature. Respect and treat the great outdoors as you want to be treated. Optional: 1/2 cup nuts, such as chopped peanuts, walnuts, pecans, or sunflower seeds. Preheat oven to 325°and butter a 9-by-9 inch baking dish (one with smaller dimensions will yield thicker bars). In a large skillet, melt butter and stir in oats. Over medium heat cook, stirring occasionally, until oats begin to color a bit darker. Add crisp rice and continue to stir until oats are a couple of shades darker than when raw. Pour oats into a large bowl and stir in flaxmeal and cinnamon (and nuts, if using). To make syrup, put honey, brown sugar, molasses, and salt into a small saucepan. Over medium heat, cook, stirring to combine, until evenly boiling, about 6 minutes. Don't skip the boiling! It's the secret to a good, chewy granola bar. Pour syrup over the oat mixture and toss very thoroughly, to coat every last flake evenly in syrup. Make sure you scrape out every bit of the syrup from the saucepan. Transfer granola mixture into prepared pan. Butter your hands and press oat mixture firmly and evenly into pan. Bake for 25-30 minutes, rotating pan halfway through. The outer edge of the granola bars should be a little bit darker, and the bars should have a nice sheen. Remove from oven and let cool for 10 minutes. Cut into quarters, then into quarters again for a total of 16 squares (you can cut into long bars, as pictured, but you will have some scraps left over). Remove from pan and cool before eating. They will keep in an airtight container for up to 3 days. *The original recipe, for Granola Bars, calls for raisins. Since we can do without raisins but love a bit of crisp, I substituted crisp rice and scaled back the oats a bit. Good to the Grain is a gorgeous cookbook filled with wholesome treats.